Its basically a kitbash combined with some scratchbuilding. The roof and floor are from a Roundhouse Overland car and the sides and ends I scratchbuilt by combining layers of thin styrene sheets to make the windows and doors. 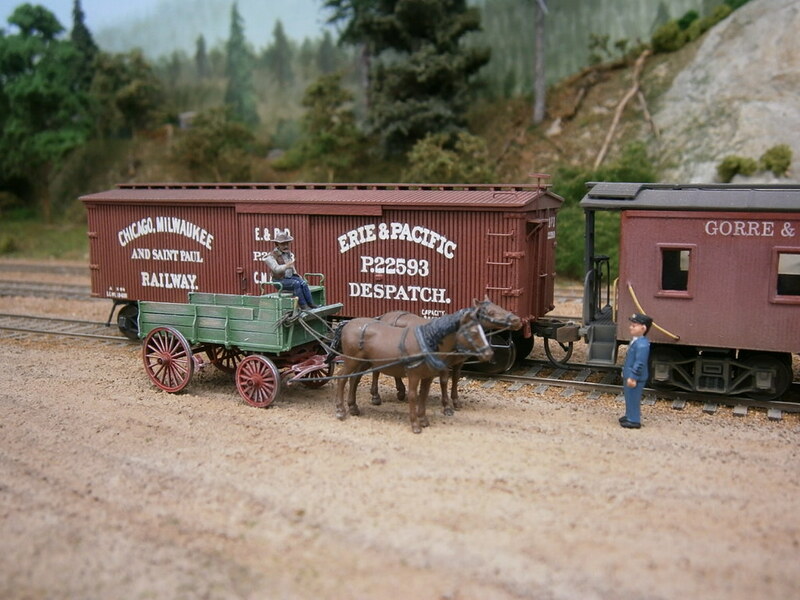 The paint and livery was made from large decals which artwork I had got from a another modeler Mr John Ott. I had made decal artwork for my 4-4-0 Aeolus based on the Central Pacific Jupiter which I traded with him for his artwork. So the credit for the decal artwork should go to him. I only have changed the colors and some details from the original. The sides and ends had the windows and openings cut out using the decal artwork that I printed on ordinary paper and then glued with paperglue to the styrene sides. The openings were then cut after the print and when finished I removed the paper. The trucks are from Bitter Creek Models which I added my own 3D printed brake assemblys made by Shapeways. The decals for the striping on the trucks I made and printed myself. 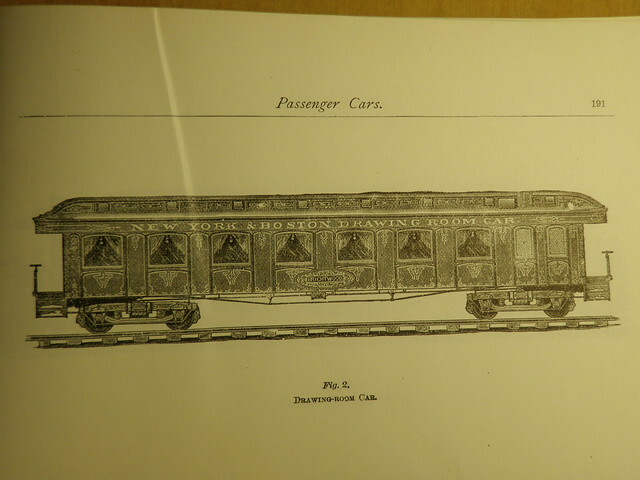 The basis for the car is a drawing in the 1879 Car Builders Dictionary on a Wagner drawing room car. I'm currently building some more scenery parallell with learning to make trees with Jos method. I'll post some more pictures shortly. 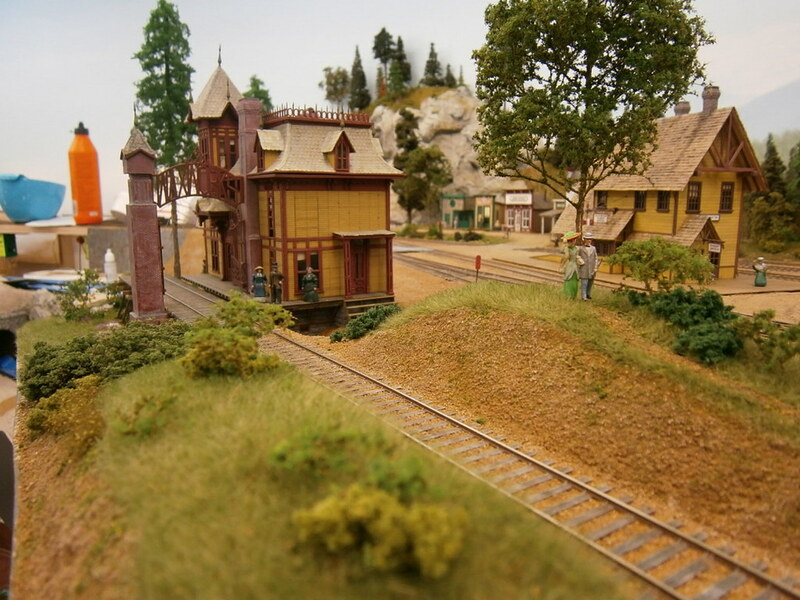 I looked at your building thread and must say that your mini layout looks very nice . I especially like the waterfront. My hat's off to you! It's not often that we see such a masterful job done an a piece of rolling stock. Truly, a one of a kind model! 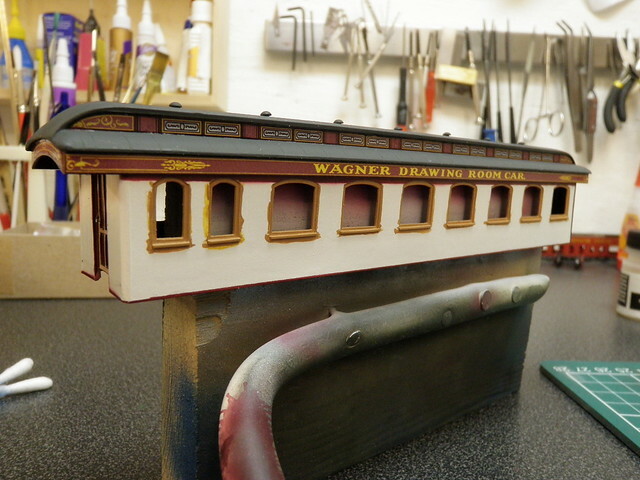 I like the technique that you used in building the Wagner passenger car. the paper "sides" were then used as templates for the side dimensions and to locate and cut the correct window openings. 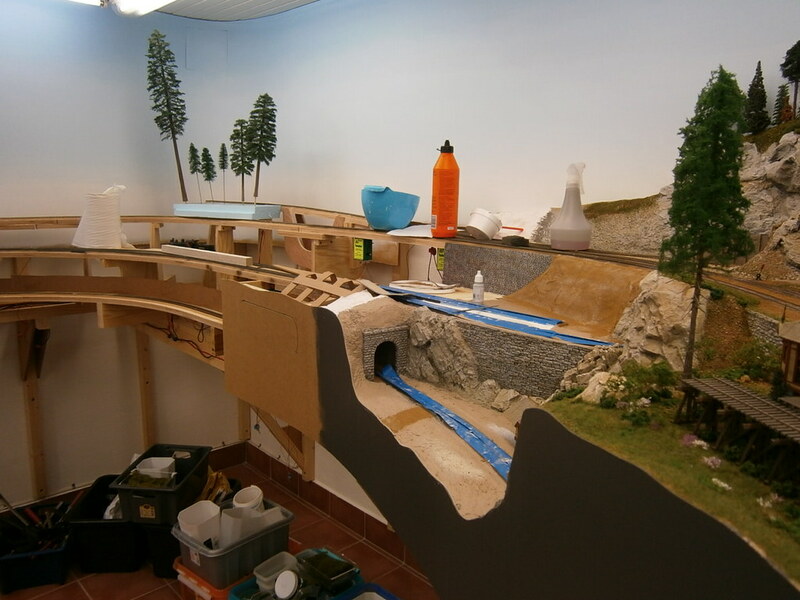 Of course this did not include the roof, did you have to stretch the roof and underfloor of the donor Overland car in order to match the length of the Wagner car? The arched ends on the roof also add a very authentic touch. Speaking of the roof, may I ask what you used as a roof covering? It appears to be maybe . . . paper?? Sorry for so many questions. But I think that there are some passenger cars that I'd like to attempt to recreate and you clearly have a very successful building technique. Yes, I glued the paper to the styrene with a cheap school paper glue which made it easy to remove the paper afterwards. -the paper "sides" were then used as templates for the side dimensions and to locate and cut the correct window openings. Yes, where the decals met a corner or something I first primed with a color similar to the decals maroon color. You can see this on one of the photos. I then applied decal softening solution in several passes to make it adhere better to the surface. Last I applied some coats of satin varnish. . I used some modelers license and made the car in 50' length instead of abt 60' that it is on the drawing so I didn't need to lengthen the roof and underfloor. The seams were done by a little cheating. I only scraped them into the roof using a very small screwdriver. Hopefully it answered some of the questions. The hardest part of the build was to get the window openings symmetrical. Even if I had the template it was difficult to cut the openings. They needed a lot of trimming to look somewhat ok.
No trouble Greg, I'm not very good explaining things . Just ask if there is anything else you're wondering about. I'm a bit addicted to making these type of cars so next time I'll build one I'll see if I can make a thread of it. When you start building it would be great to be if you could have a thread on it. H�kan, I just found this thread... (don't wander far from the On30 forum usually). Your work is wonderful... this will be a splendid layout! I'll be following with interest! Many thanks, Troels for the kind words! . And with the help of all the talent and knowledge here on this forum it hopefully will also improve. Off course I missed posting this before the deadline the Challenge deadline . If someone reads this that participated in the challenge I would to take the opportunity to say thank you to all. It has been great being part in the Challenge being a newbie and all. 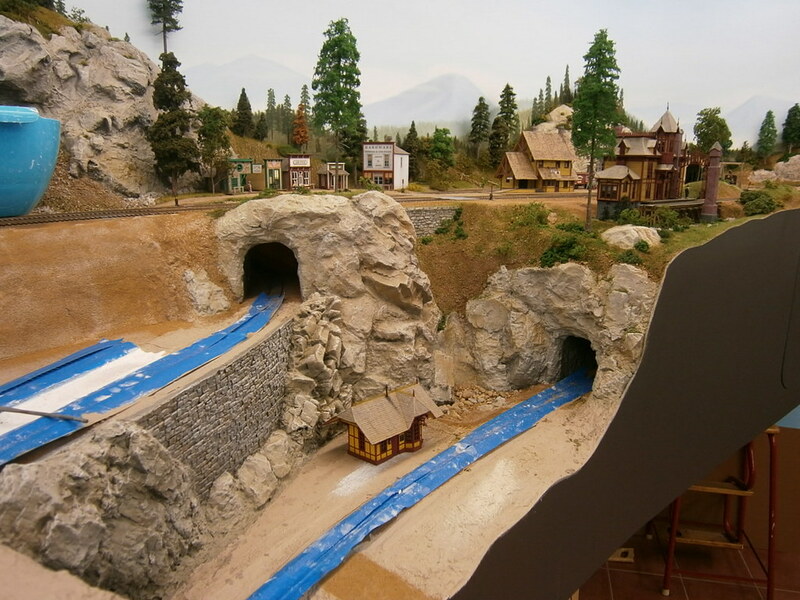 A lot of great modeling was done and I have learned alot. 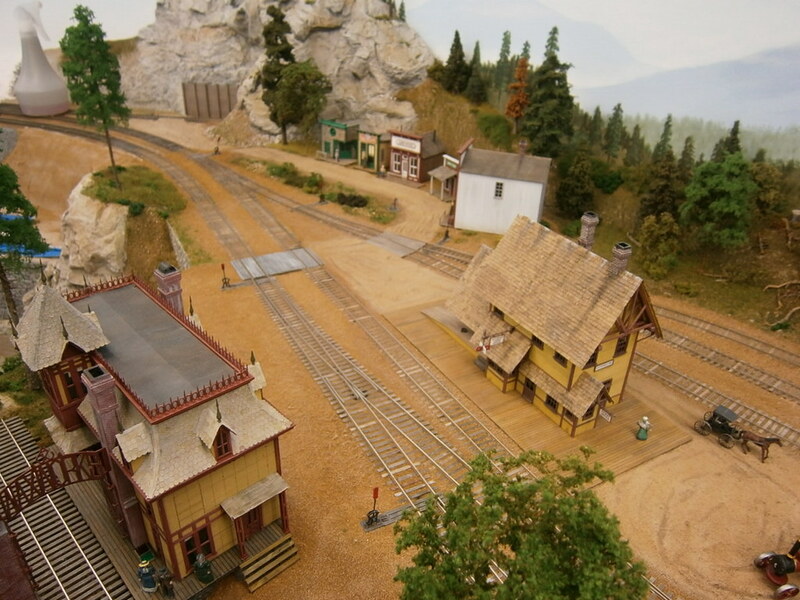 The Redwood grove to be situated in the corner. A lot of trees to make . The team track. One of the local farmers due to unload a shipment.